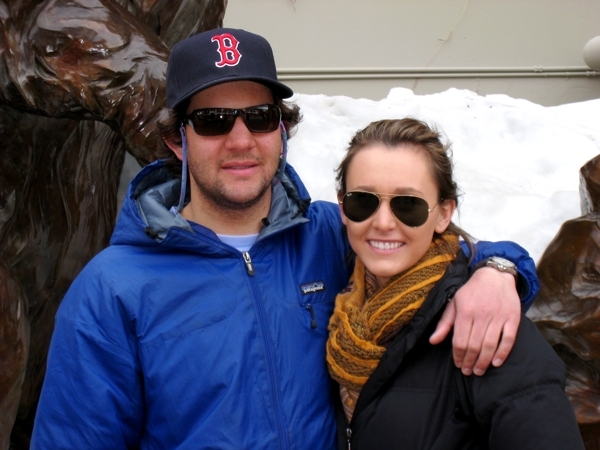 Picture taken of my girlfriend (Anne) and I in Vail. March 2010. My name is Evan Spirito. I am 24 years old and I have NSCLC driven by a mutation in my ALK gene. I was diagnosed in January of 2009 when I was 21. The cancer originated in my left lung and, by the time I was diagnosed, it spread to my lymph nodes as well as a couple brain metastases. I had the brain mets “zapped” right away with proton beam radiation and then I started chemotherapy. I experienced good results on the Patel Regimen (Carboplatin/Alimta/Avastin) for 6 cycles and then remained on maintenance chemo for several months following. Unfortunately, my cancer started to come back in the spring of 2010. The results of my genetic testing came back in the meantime and confirmed that my cancer was driven by the ALK mutation. I was put on the Crizotinib trial and again experienced good results with very little side effects. I stayed on the trial for about a year before my cancer once again showed progression in the spring (March 2011). I started on the STA9090 trial next, however, it proved to be largely ineffective on my disease with the addition of nearly intolerable side effects. After about a month “wash out” period, I began my latest and current trial (LDK 378). Linnea and I share the same oncologist (Dr. Shaw). She reached out to me a few weeks ago and we discovered that we had quite similar experiences/treatments in our individual battles with cancer. Linnea was about to start the LDK trial herself and, as far as I know, we are two of only a handful of patients currently on the trial. The trial is comparable to my experience on Crizotinib, which was the best/easiest treatment I’ve had to date. The first couple visits are quite long (as Linnea described in her latest post) but after that it gets better. You will dose once a day and go in once a week for lab work and a check up. I have not seen any noticeable side effects from taking the pill apart from one vomited dose in the first week. For me, the most annoying part of the trial is the eating requirements. Fasting for 2hrs before and after dosing is no fun but if you work out a consistent schedule it will not be an issue. I tried, and may try again, dosing right when I woke up (before eating), then going back to bed for 2hrs before eating breakfast. If your stomach can manage, it might be worth a try. In my case, it took a solid 7-10 days before I really began to feel the pill working. Sure enough, my first set of scans revealed a major decrease in my disease, which is very encouraging. Things were going rather smoothly until I suffered a minor set back in the form of a chest infection, but with any luck the antibiotics should take care of that and hopefully I’ll be back on track in another week or so. While being treated for the infection, Dr. Shaw did notice “slight progression” in my disease; however, not enough to take me off the LDK trial. So, as of right now I will continue with the trial for as long as its continues to keep the cancer down. I hope this little bit of information helps but I’m also aware that every situation is different. As always, take it one day at a time, focus on what’s important going forward, believe in the treatment and it will work! Evan is an incredibly brave and strong young man (yes, you can get lung cancer when you are only twenty-one). As the LDK378 trial is yet so nascent, there is very little in the way of anecdotal informational provided by actual participants. He was kind enough not only to agree to meet me but to generously share his own experience thus far here. Hopefully it will prove useful to other ALK ‘mutants’ who may be considering the LDK trial. This entry was posted in ALK mutations, clinical trial, Coping, lung cancer survivor, positive attitude and lung cancer and tagged Evan Spirito, LDK378, lung cancer in your twenties. Bookmark the permalink. Thanks so much for sharing this information, Evan. It is extremely helpful to me and my family (my father has NSCLC that has responded well to Crizotinib, but we’re looking ahead at options). Thank you too, Linnea, as your blog helped us when my father originally started the trial almost 22 months ago. It’s kind of you both to share your experiences with the “uninitiated”. This frightening journey becomes a bit easier when others are sharing their light. Thank you for sharing Evan. I was directed to your blog by Linnea. Keep taking one day at a time, and never stop believing. Thank you Evan and Linnae for sharing your experiences. It is so helpful for those of us who one day will be enrolling in this or another post Crizotinib trial. Sending all good thoughts your way! Linnea, thanks for your guest post by Evan. As we’ve learned, the doctors and scientists are not generally allowed to reveal how study patients are doing. They can’t even tell you simple things like how many people are enrolled to date. There don’t seem to be any non-disclosure requirements for participants, so it’s of great help to get some first-hand information when trying to make decisions. Thanks Evan for sharing! I do have one question for Evan — how long have you been on the LDK378 now and how long was it between your scans? I’ve been on LDK378 since late-June (2011) although I am not sure of the exact start date. I get scans about every 6 weeks unless I am experiencing significant symptomatic changes. Thanks for all the support, let me know if you have any other questions! You are a champion!! My mom just got on a Crizotinib trial. But, I’m 24, and cannot imagine how you are so brave! I hope you are doing well. I was diagnosed with the ALK gene rearrangement in June 2010 at 39. I was also on crizotinib for 10 months. It worked wonderfully but a very stubborn lymph node decided to start growing again. I’m looking at getting into one of the next trials. Stay strong. Thank you so much for the information! Youre a star! I know I am writing a long time after the latest comment. Are you still there? Where there other alternatives to LDK? Did you have to take part locally? Hi, this is Linnea replying to your response rather than Evan: sadly, he passed away some weeks after the post. As to your question, there are certainly other alternatives, with quite a few ALK inhibitors in the pipeline or in trial at the moment. I have been on LDK since September of last year and (fingers crossed) will eke out a few more months. Stay strong and hopeful, I was 45 when diagnosed and will turn 53 next month–an age I once thought unattainable!